Exclusive Red, Black & White Splatter LP. Reverse board, die-cut, gatefold sleeve (die-cut exclusive to Dinked Edition). 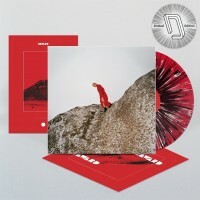 Limited red vinyl in a gatefold sleeve. 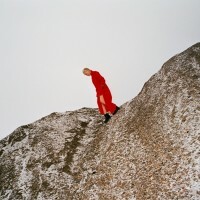 It was on a mountainside in Cumbria that the first whispers of Cate Le Bon’s fifth studio album poked their buds above the earth. “There’s a strange romanticism to going a little bit crazy and playing the piano to yourself and singing into the night,” she says, recounting the year living solitarily in the Lake District which gave way to Reward. By day, ever the polymath, Le Bon painstakingly learnt to make solid wood tables, stools and chairs from scratch; by night she looked to a second-hand Meers - the first piano she had ever owned - for company, “windows closed to absolutely everyone”, and accidentally poured her heart out. The result is an album every bit as stylistically varied, surrealistically-inclined and tactile as those in the enduring outsider’s back catalogue, but one that is also intensely introspective and profound; her most personal to date. This sense of privacy maintained throughout is helped by the various landscapes within which Reward took shape: Stinson Beach, LA, and Brooklyn via Cardiff and The Lakes. Recording at Panoramic House [Stinson Beach, CA], a residential studio on a mountain overlooking the ocean, afforded Le Bon the ability to preserve the remoteness she had captured during the writing of Reward in Staveley, Lake District. Over this extended period a cast of trusted and loved musicians joined Le Bon, Khouja and fellow co-producer Josiah Steinbrick - Stella Mozgawa (of Warpaint) on drums and percussion; Stephen Black (aka Sweet Baboo) on bass and saxophone and longtime collaborators Huw Evans (aka H.Hawkline) and Josh Klinghoffer on guitars - and were added to the album, “one by one, one on one”. The fact that these collaborators have appeared variously on Le Bon’s previous outputs no doubt goes some way to aid the preservation of a signature sound despite a relatively drastic change in approach. Be it on her more minimalist, acoustic-leaning 2009 debut album Me Oh My or critically acclaimed, liquid-riffed 2013 LP Mug Museum, Cate Le Bon’s solo work - and indeed also her production work, such as that carried out on recent Deerhunter album Why Hasn’t Everything Already Disappeared? (4AD, January 2019) - has always resisted pigeonholing, walking the tightrope between krautrock aloofness and heartbreaking tenderness; deadpan served with a twinkle in the eye, a flick of the fringe and a lick of the Telecaster.